On weekends away, I’m grateful to be a morning person. 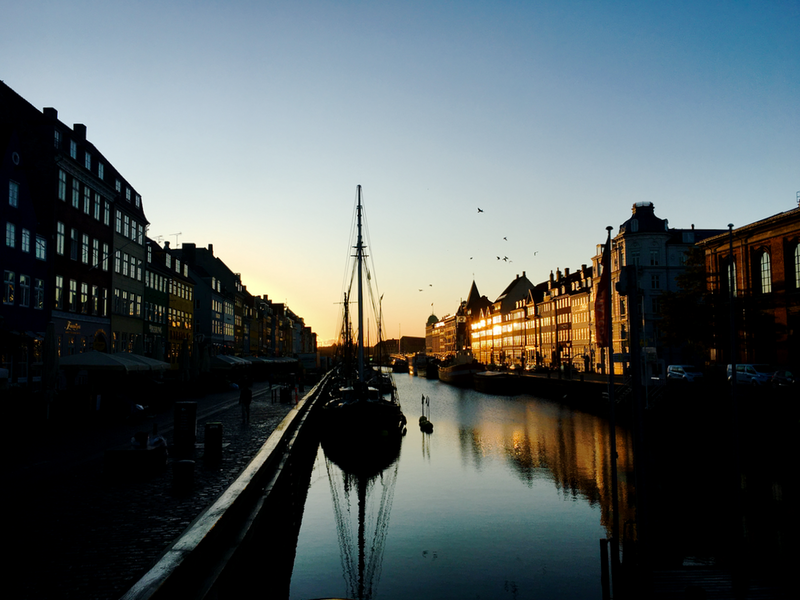 Even though my eyes were puffy with little sleep and my belly was rumbling, ready for some breakfast, I wrapped myself up with only camera(s) in hand to see Copenhagen at sunrise. Always on the hunt for the perfect photo, I couldn’t miss the opportunity to see this water-bordered city wake up. So while Jack snoozed, I explored. 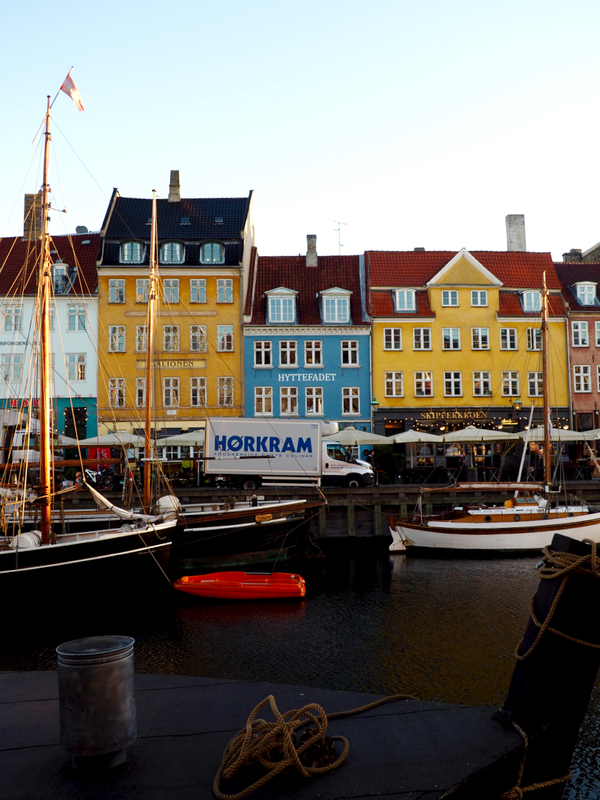 I headed to Nyhavn, the colourful strip that’s plastered on postcards. And there I waited for the sun to grace to city. 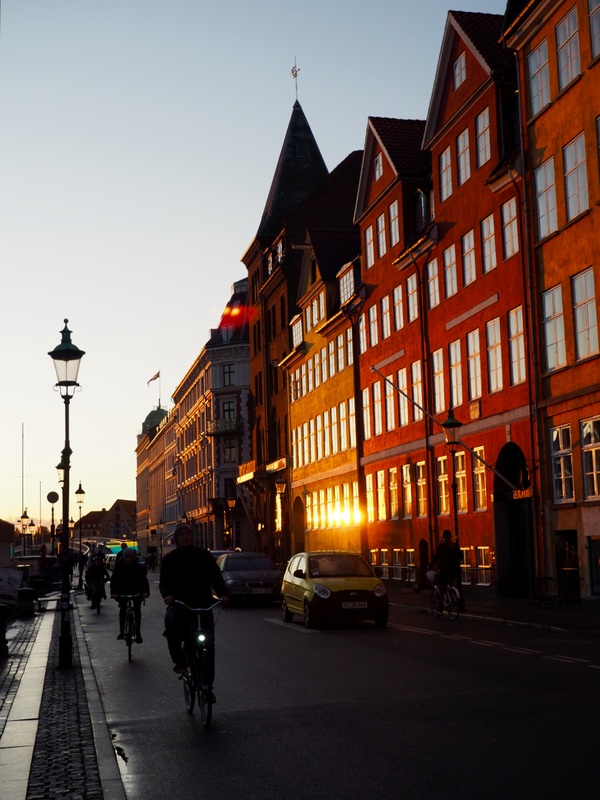 As I waited, the city began to wake up and I was grateful to have inadvertently chosen a Monday for this sunrise viewing as city workers and school children cycled past me and I became part of the Copenhagen cityscape. I played the tourist, a role I’m so used to seeing travelling to work in London. 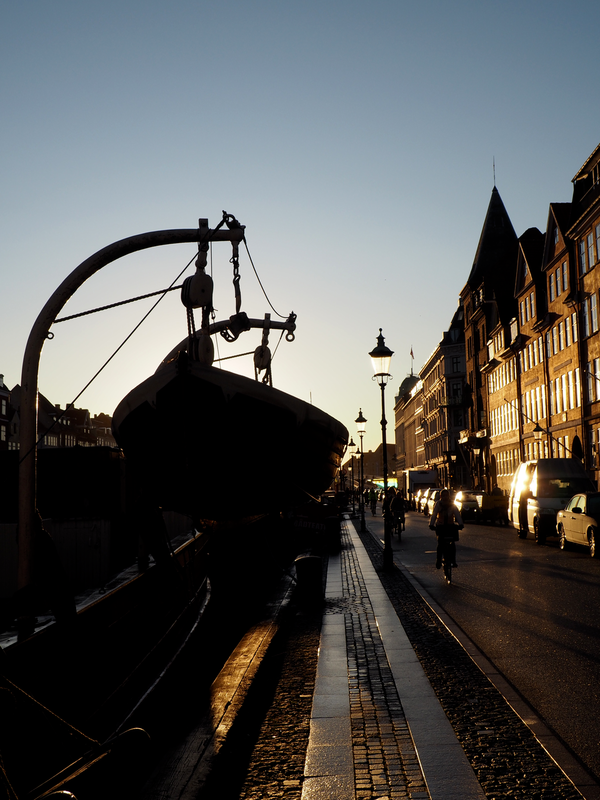 In the warmth of the rising sun, it was as if someone had turned the saturation up on Nyhavn. The houses, normally a striking collection of different colours, were aflame in a brilliant sunrise. 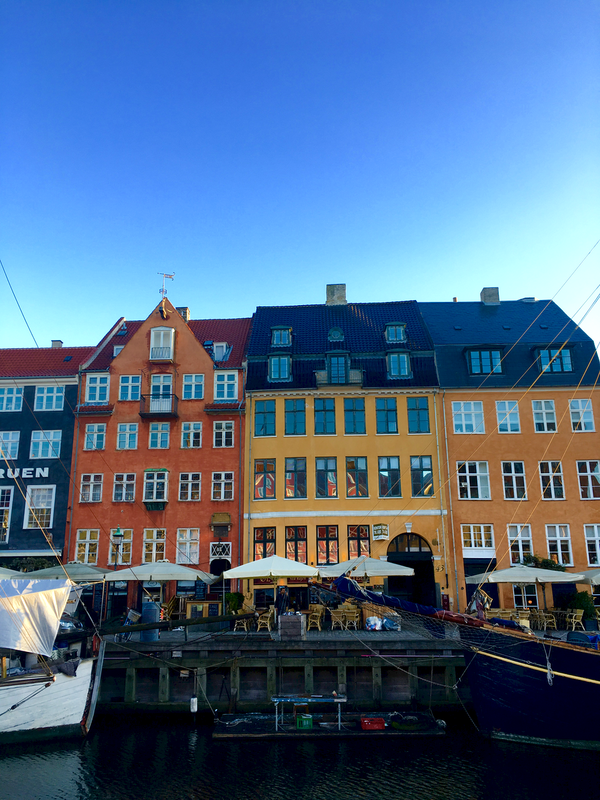 And the combination of these many-hued houses, the water, the cobbled streets and the stream of bicycles with wheels flashing in the sunlight and bells trilling in chorus made for the most thrilling, not to mention photogenic, atmosphere. I spent forty-five minutes hot-footing it around the surrounding area, trying to shoot as many different angles, in as many different types of light as I could, all whilst soaking in Monday morning in a foreign city. It was glorious. Once I’d had my fill of photo taking, and with the sun well and truly up, I went back to our hotel with a rumbling stomach to pick Jack up. 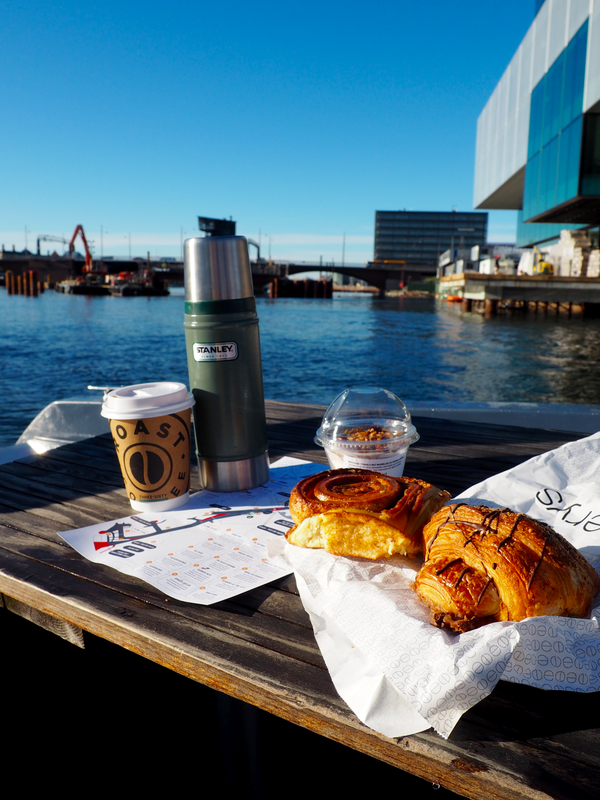 Our final breakfast in Copenhagen was to be on the go, so we plumped, perhaps unimaginatively but with absolutely no regrets, for a selection of buns and pastries. 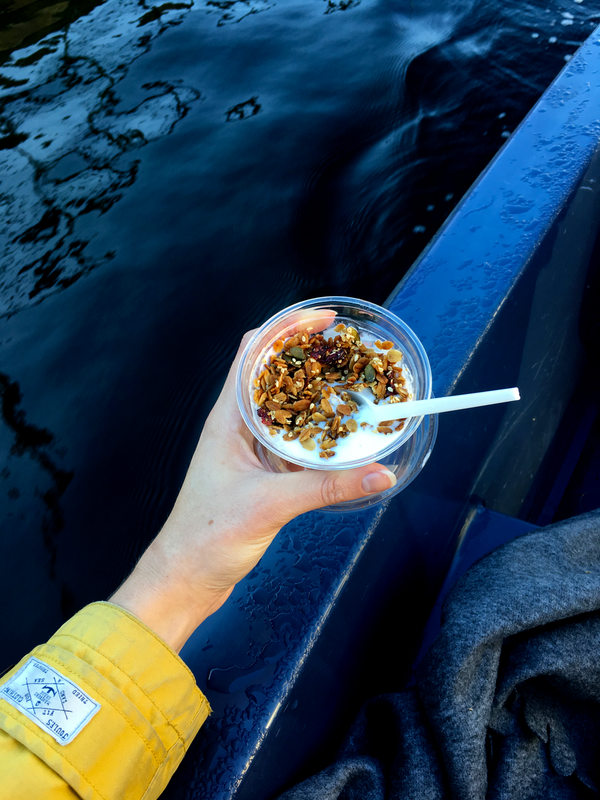 Then we headed for the water, as today, breakfast was to be enjoyed on deck. 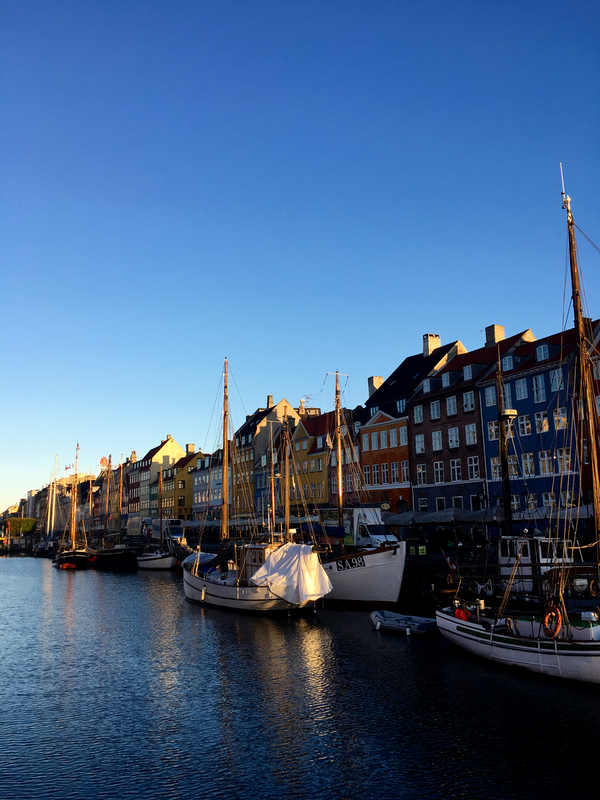 Having walked the streets of Copenhagen we wanted to get to know another essential part of the city: the waterways. In the summer season you can do this by kayak, but we visited just as the winter season began so plumped for a GoBoat instead, and what a sweet experience it was. Once you’ve picked up a selection of maps and blankets, you’re left to your own devices with a little boat of your own, complete with table for (in our case) breakfasting. 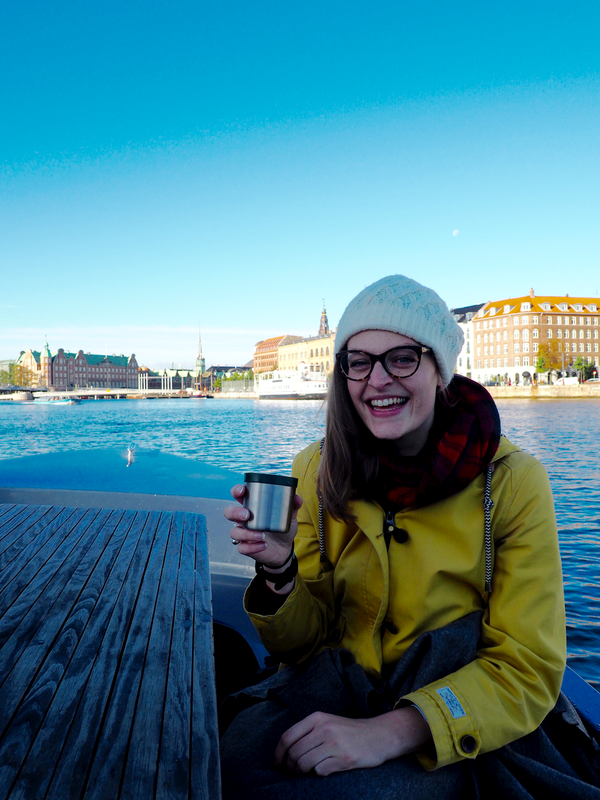 We hopped aboard and whilst Jack steered us out into the quiet Copenhagen canals, I dished out breakfast. Strong coffee for him, Earl Grey tea for me and pastries aplenty. Oh and some yoghurt too, as one can’t just have buns for breakfast (there’s some logic in there somewhere, I’m sure). 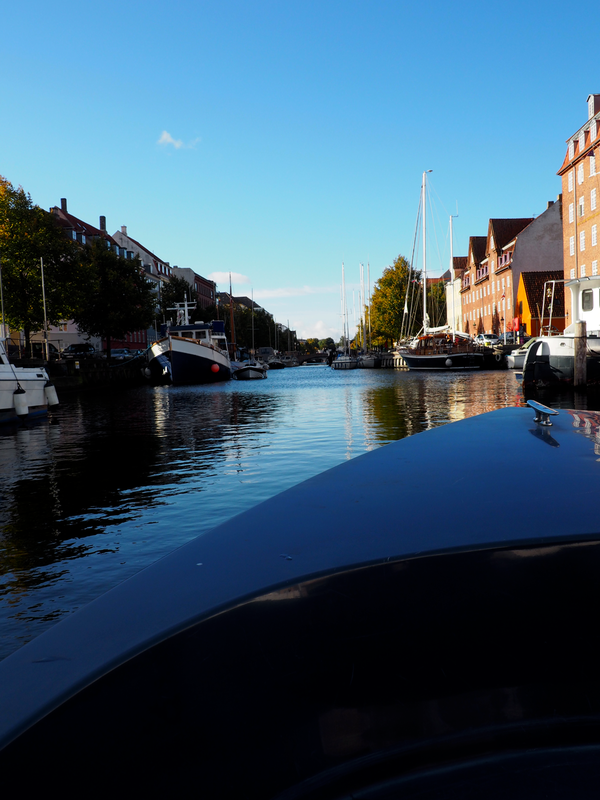 We were stunned by how incredibly quiet the waterways were in Copenhagen and only saw a couple of other boats putter past us quietly as we snaked through back canals and main waterways alike. I can’t imagine the same sense of peace in London or Paris and would thoroughly recommend experiencing the city in this way if you get a chance. It's a calm, beautiful and refreshing, inverted view of the city. After two hours on the water we longed to stretch our legs so wandered into the city centre where I couldn’t resist the opportunity to pick up a couple of pieces of Scandi-style crockery and Jack couldn’t resist the urge to pick up some LEGO. We all have our vices. Another vice of mine is delicious and exquisitely presented food, which is exactly what was on the menu for lunch at Väkst. We hired bikes for the afternoon to explore a little more of the city and first on the agenda was food, of course. I’d read good things about Väkst and it made the cut as it was both up-market and still affordable. 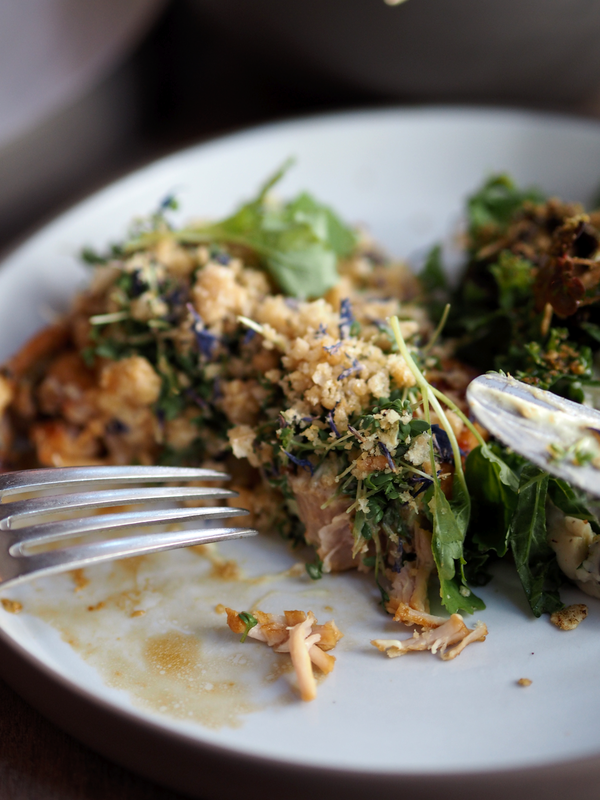 Real talk: eating in Copenhagen isn’t cheap so you have to box clever with your meals. For us, this meant some meticulous research and rigorous budgeting. 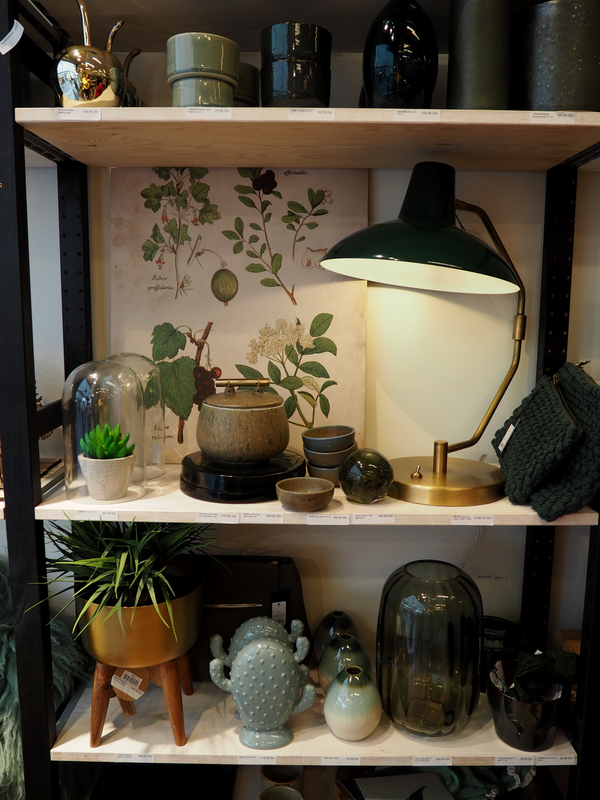 Väkst was beautiful with interiors straight from a pinterest board. 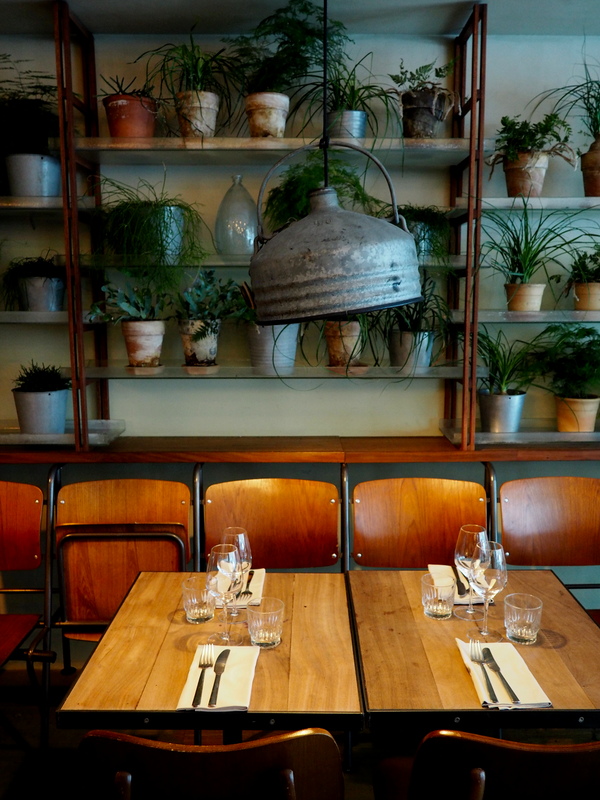 Warm wood and industrial steel made up the furnishings and the place is bedecked with flowers and greenery. 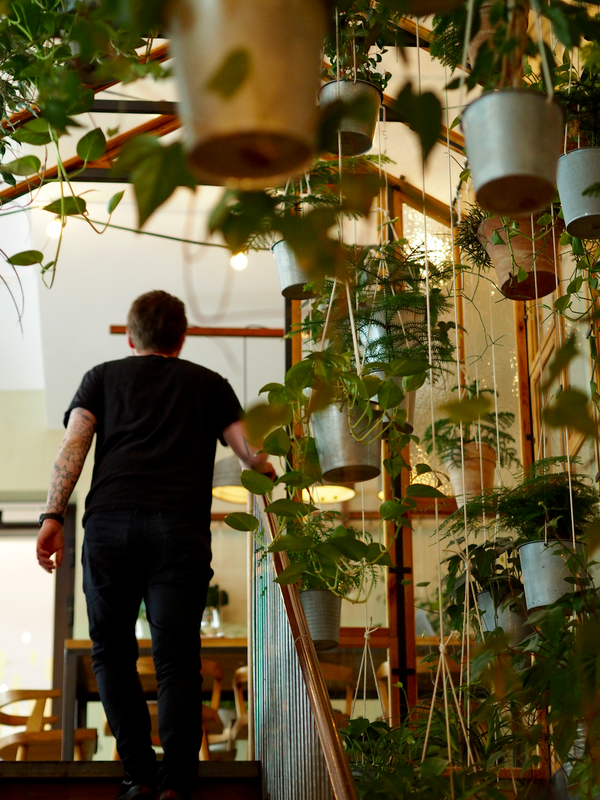 My eyes were immediately drawn to Väkst’s interior greenhouse. 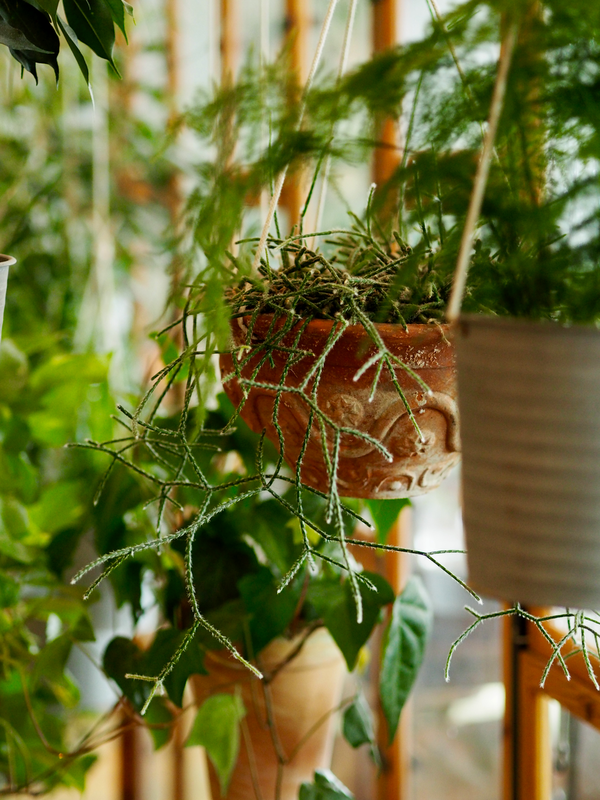 Gleaming glass houses pots of plants that only when you circle the entire structure, do you realise are hanging from the greenhouse’s ceiling, suspended in mid-air in ethereal beauty. But shall we talk about the food? We plumped for the set lunch menu, which changes with the season. We started with dark rye bread with soft cheese, followed by pork from Grambogaard with mustard and crackling served with truffle mash and dark curly kale and we finished with a white chocolate, cucumber, elderflower, sorrel & skyr ice cream dessert. We ate slowly and with a little extra attention to our table manners – this was no street food joint. The dishes arrived, works of art. And we enjoyed a little modest theatre at dessert too, as a member of the kitchen finished our dessert at the table, pouring over the cucumber liquor. 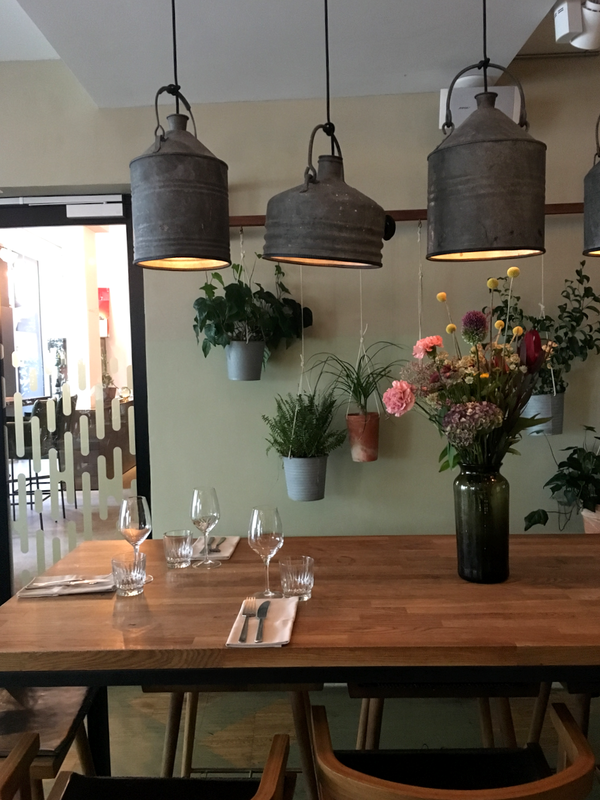 We met the performance of the meal with our own, gracefully poised wrists delicately wielding cutlery and sampling Väkst’s food in small and precise mouthfuls. This is not our usual way of eating, which is whole-hearted, enthusiastic and sometimes messy. It was delicious, no doubt, but it wasn’t the enveloping warmth of a too-big bowl of porridge, or the giddy generosity of an overflowing pint of Danish beer. I’m pleased to come away from Copenhagen with a more rounded picture of the food scene, but I think I’ll always favour the less ceremonial food moments, where etiquette is not high on the agenda, but big-hearted, generous, down-to-earth helpings are. Lunch finished we cycled on, mimicking Copenhagen locals who stream down the cycle highways with ease, in harmony with other traffic. As a London cyclist I was envious of the set-up. Copenhageners don’t feel the need to wear helmets or hi-vis vests, they just continue with their day safe in the implicit knowledge that a harried driver won’t impatiently knock them off their bike. It felt safe, it was lovely. 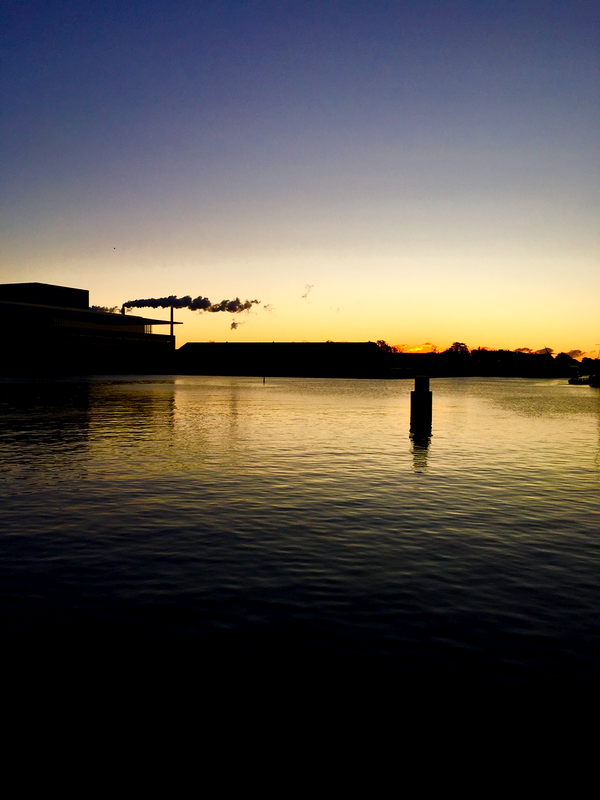 We cycled over to a new part of the city, Nørrebro. 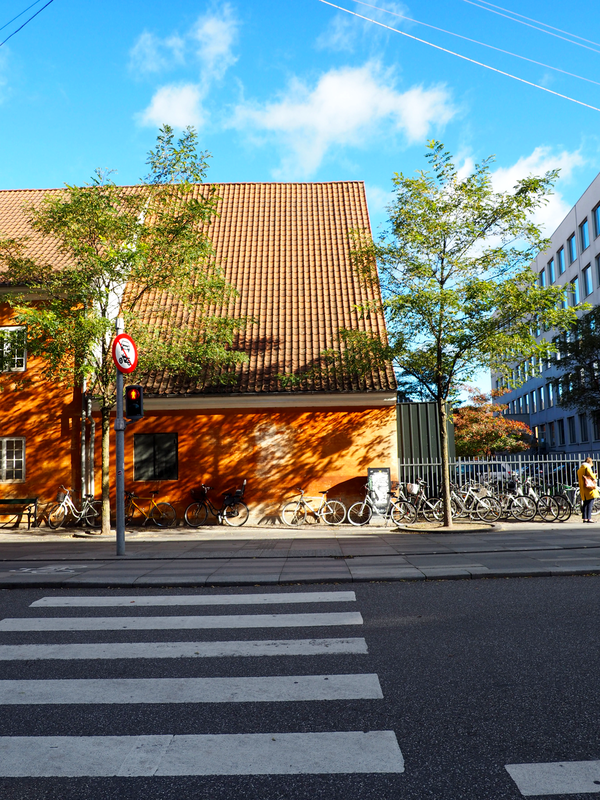 It had a different, younger, more urban feeling and for the first time in our visit, I felt as if we’d found where the younger residents of Copenhagen might spend their time (do I sound like someone’s Grandma?). We’d headed to this district particularly to see the striking Superkilen, which is the most impressive stretch of tarmac I’ve ever seen. 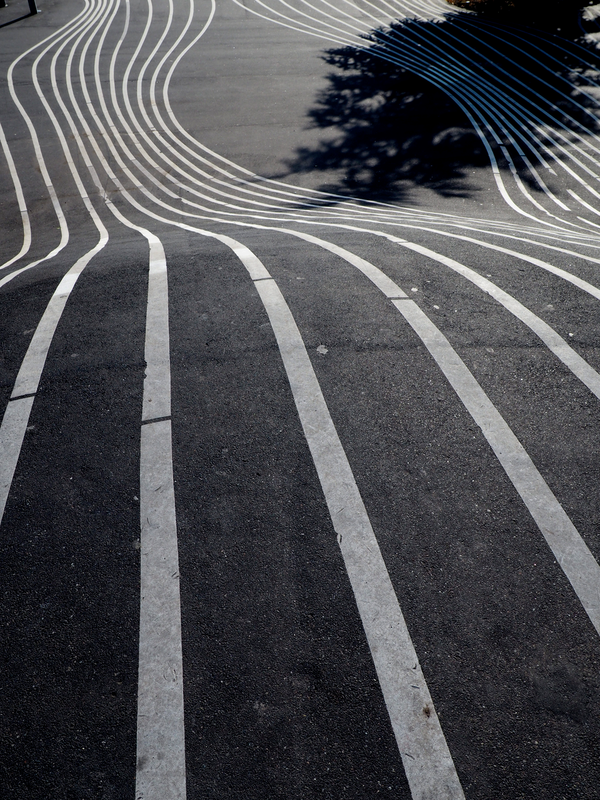 The design visionaries of Copenhagen, clearly not content with producing a standardised recreational area added their stamp to the Superkilen in the form of disorientating, rippling lines of white paint. It’s quite a sight. 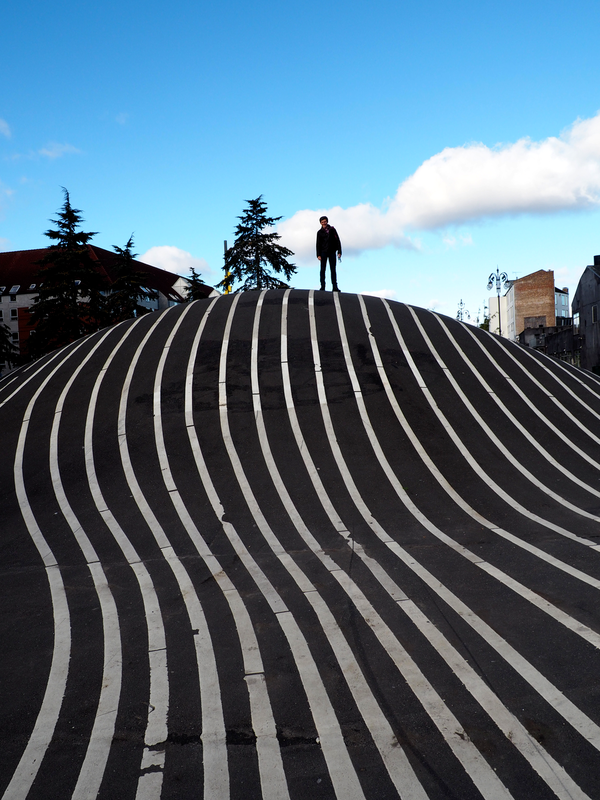 With my SD card full of Superkilen shots we pedalled on, building up an appetite for a coffee break. 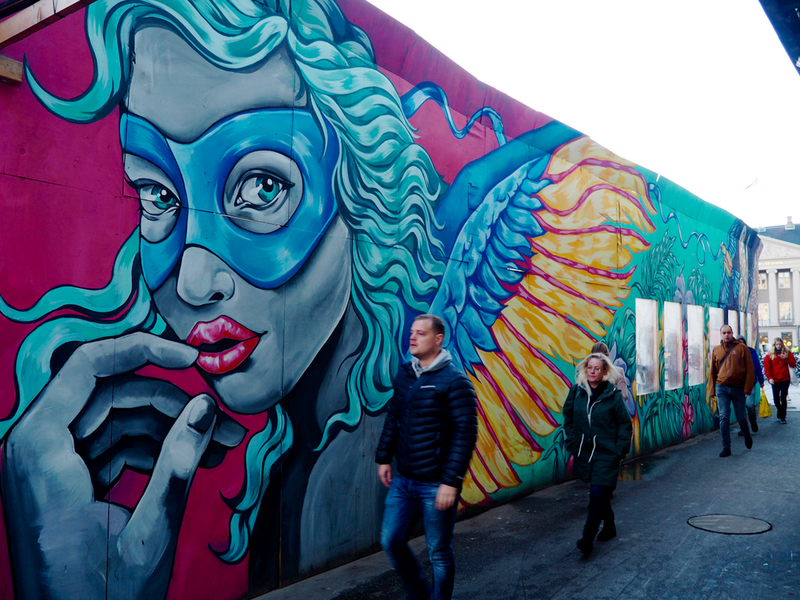 In Nørrebro we cycled through skate parks and green spaces, through urban areas and old cobbled streets. 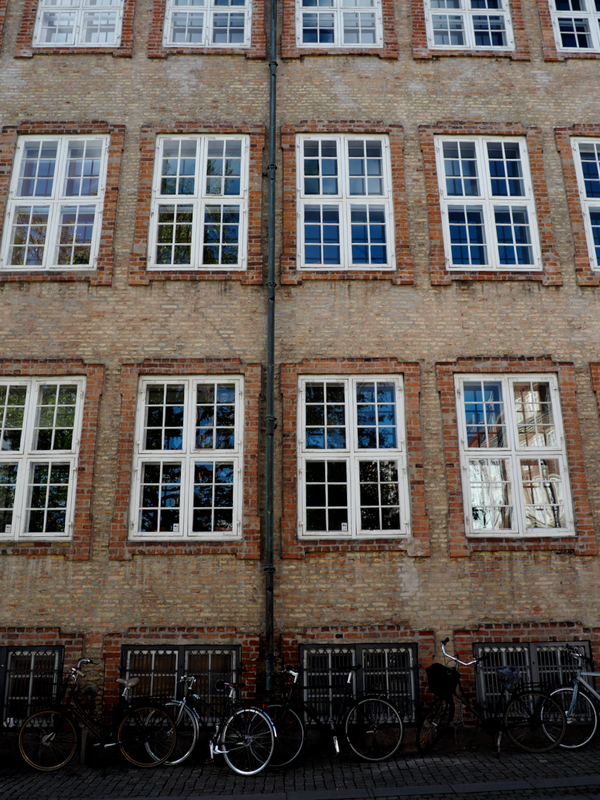 In this part of Copenhagen, old and new collide spectacularly and this all adds to the palpable feeling of cool. This was epitomised by our next stop, the Coffee Collective, which is an infamously trendy coffee shop that sits nonchalantly between rows of cobbled, old-fashioned streets. This is another venue that’s slightly too cool for us, but we were unphased and geekily observed for the twenty mintues we were there. Obscenely cool, minimalist décor, creative-type collectives tapping away on laptops, outrageously beautiful baristas who looked like they’d strolled off the set of an Arket advert. We drank our coffees (well, Hot Chocolate for me. Caffeine makes me jittery and looses me even more cool points) outside, people watching. This spot almost reaches Chelsea-like vibes, with young, attractive people sipping coffee with their French bulldogs at 4pm on a Monday afternoon. It’s defining feature is the young, attractive people are all effortlessly cool, rather than boringly posh (sorry coffee drinkers of Chelsea). With time ticking on, and Jack and I’s instinct to be early for all and every flight kicking in, we headed back to our hotel to swap our bikes for our bags. We had just enough time to snap a few pictures on our cycle back. Danish people look at you like your crazy if you pose outside their houses with a bike. Ah well, I won’t be back for a while and I promise not to judge the next selfie I with a Boris Bike I see in Hyde Park. And that, sadly, was that. 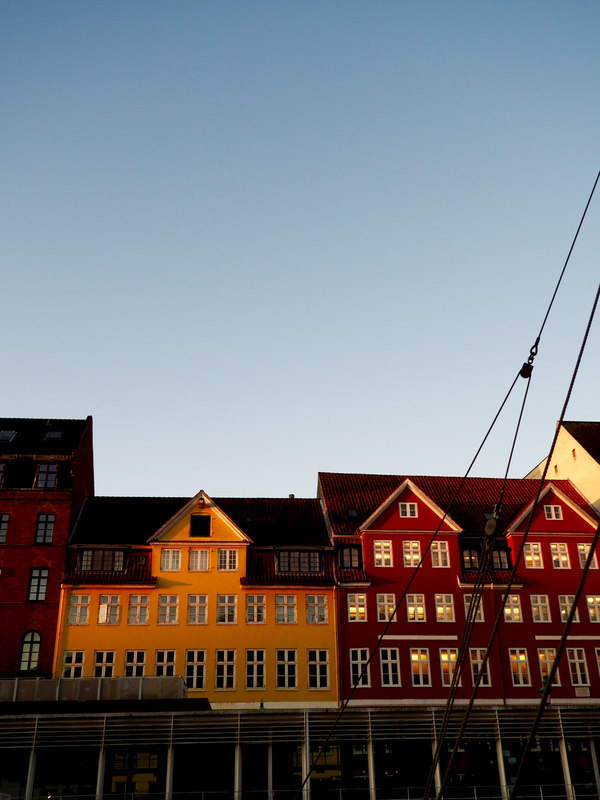 We picked up a final couple of pastries from the airport and I managed to snap one last shot of Nyhavn but then our weekend in Copenhagen had come to a close. We’ll be back I’m sure, to this city we felt not only so welcome in, but so at home. For the quietness of the place, the beautiful outdoor opportunities and the inventive and endless food, which we loved and were inspired by. Read the whole Copenhagen story: Copenhagen I, Copenhagen II, Copenhagen III (+ a Little Film).